Mark was born in Dayton, but lived in Rochelle, Illinois as a teenager and in Boulder, Colorado during his 20s. He’s lived in Dayton ever since. 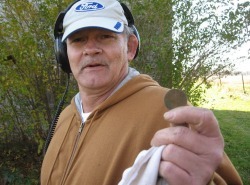 Mark uses a Minelab Explorer detector and said, “Anytime you detect and find anything of interest it is a good find.” He is mainly a coinshooter but like many of us enjoys recovering any interesting relics. He learned of the Dayton Diggers on the internet.